17 Music Entertainment's Matt Gary has been making the radio rounds in the Southeast and Midwest to introduce his new single, "I'm Just Sayin'," penned by Frank Myers, Gary B. Baker and Billy Montana, the title track from his CD 6-Pack. (L-R): Gary, WCTQ/Sarasota, FL MD Heidi Decker and WCTQ PD Tim Jones. Whoa, where does the time go? Country Radio Seminar starts next week, so make plans to attend MusicRow’s annual Meet & Greet and CountryBreakout Awards, featuring special performances from Joanna Smith and Colt Ford. The event takes place Tuesday, March 1, 2:30-5 pm CT at Cadillac Ranch on Broadway. Email mstephens@musicrow.com for more information. Don’t miss this one! Kenny Chesney’s “Live A Little” is on the fast track to chart dominance. After capturing the biggest debut last week, it picks up the greatest spin increase this week and leaps to No. 31. Toby Keith’s “Somewhere Else”–also just two weeks old–has moved all the way to No. 37. Soon both singles will be battling against Ronnie Dunn’s “Bleed Red” (No. 16) and Keith Urban’s “Without You” (No. 21) for position. Lucy Angel recently visited KGRT/Las Cruces, NM. 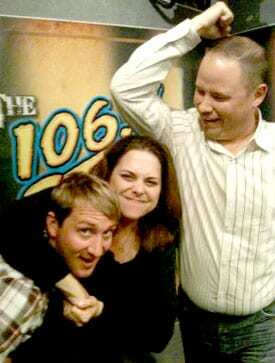 (L-R): Lucy Angel's Kate, Las Cruces March of Dimes Dir. Becky Horner, Lucy Angel's Emily, KGRT MD Sheila Kirsch, and Lucy Angel's Lindsay. Big Machine’s Eden’s Edge was in the Dallas office of Citadel Media on Tuesday (2/22) to share their music with employees. The group talked about growing up in Arkansas and meeting each other in college. (L-R): Carl Anderson, Sr. VP Programming and Distribution for Citadel Media; Eden’s Edge’s Cherrill Green and Hannah Blaylock; Gary Reynolds, PD Today’s Best Country; Kris Wilson, MD Today’s Best Country; Eden’s Edge’s Dean Berner; and Jeremy Robinson, The Jeremy Show. 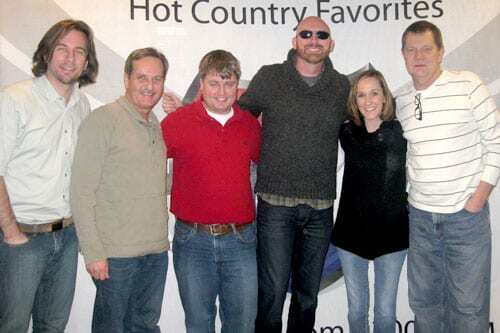 Corey Smith stopped by WUSY in Chattanooga on Wednesday (2/23) to visit with US 101’s personalities and loyal listeners. 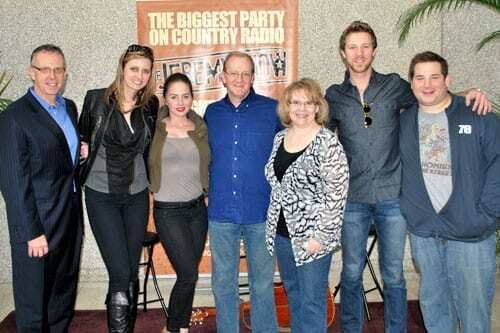 Corey chatted with Brian Stewart and played a few songs on-air including new single,“Twenty-One,” soon to be released on Average Joe’s Entertainment. (L-R): Gator Harrison (OM/PD), Ken Hicks (morning guy), Brian Stewart (night guy), Smith, Mo & Dex (afternoon show).